Gorgeous remodeled move in ready 1619 sq ft 2/2/2 villa. This spacious end unit is on an cul-de-sac in a gated community. Screened in entrance way with double door entry to the great room, vaulted ceiling & plant shelves. Luxury wide plank waterproof vinyl and tile throughout. Kitchen features soft close linen finish cabinets new granite and stainless steel appliances. Includes a breakfast bar, breakfast nook & sliders to the vinyl enclosed Florida room. Spacious Master bedroom has 2 walk in closets and slider to Florida room. New granite countertops in both bathrooms. Master bathroom features a walk in shower and second bathroom has a tub shower combo. Inside utility room with storage, oversized 2 car garage with utility sink. Entire inside has been freshly painted. Gorgeous enhanced landscaping, surrounded by greenery. Amenities include: gated entry, security, golf, tennis, community heated pool, club house, exercise room. Too much to mention. Very active beautiful clubhouse. There is an additional monthly fee of $114 which includes lawn care (mowing, watering, pest control, fertilizing and maintenance of landscaping) and painting of exterior on a schedule. 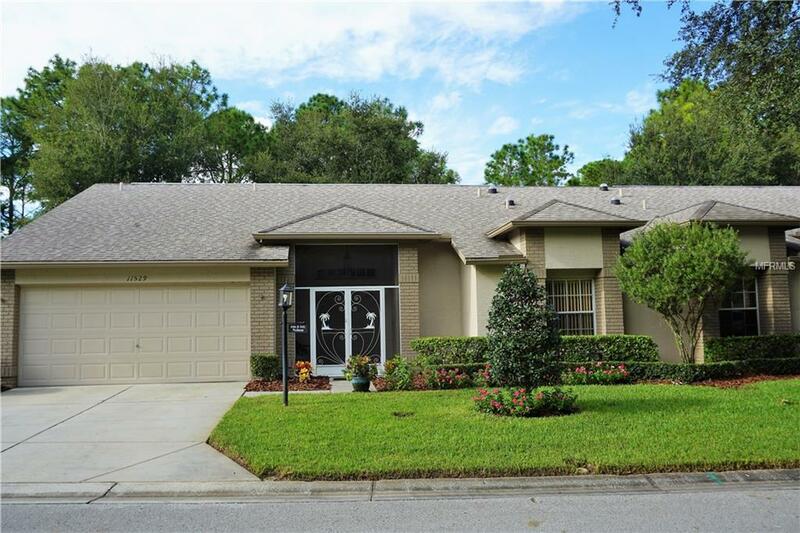 45 minutes to Tampa International airport.